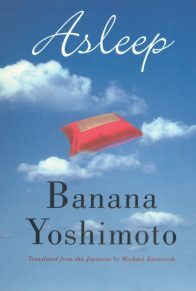 Banana Yoshimoto’s novels of young life in Japan have made her an international sensation. 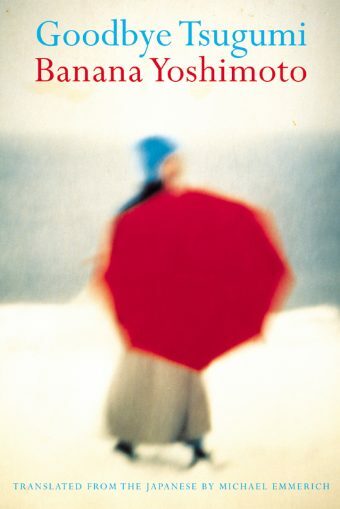 Goodbye Tsugumi, called a “witty, perceptive novel” by Elle, is an offbeat story of a deep and complicated friendship between two female cousins that ranks among her best work. Maria is the only daughter of an unmarried woman. She has grown up at the seaside alongside her cousin Tsugumi, a lifelong invalid, charismatic, spoiled, and occasionally cruel. Now Maria’s father is finally able to bring Maria and her mother to Tokyo, ushering Maria into a world of university, impending adulthood, and a “normal” family. When Tsugumi invites Maria to spend a last summer by the sea, a restful idyll becomes a time of dramatic growth as Tsugumi finds love and Maria learns the true meaning of home and family. She also has to confront both Tsugumi’s inner strength and the real possibility of losing her. Goodbye Tsugumi is a beguiling, resonant novel from one of the world’s finest young writers. It’s true: Tsugumi really was an unpleasant young woman. Leaving behind the town of my childhood, the quiet cycles of fishery and tourism that keep it running, I came to study at a certain university here in Tokyo. Now I’m having loads of fun, living in the city. My name is Maria Shirakawa. I was named after the Virgin Mother. The truth is that I’m just a regular flesh-and-blood human being, and as a matter of fact I have a fairly short temper. Though in Tokyo I often catch myself wondering just what that’s supposed to mean. People here are always getting angry about the smallest things–because it’s raining, for instance, or because some class has been canceled, or because their dog took a leak in the wrong place. I guess maybe there is something slightly different about me. Because when I lose my temper, it only takes a moment before I feel the anger start to sweep back like a wave and sink down into the sand . . . For a long time I’d just assumed that this was because I grew up in the country, that I was just laid-back in the way country people are, but a few days ago this nasty professor refused to accept an essay of mine simply because I’d turned it in one minute late, and as I was walking back home, shaking with rage, glaring at the sunset, it suddenly occurred to me that there was another reason. It’s Tsugumi’s fault–or rather, it’s thanks to Tsugumi. Everyone gets annoyed about something at least once a day, me included. But I noticed that there was something I did whenever this happened to me–that there was a sentence I would start chanting over and over deep down inside, like a sort of Buddhist chant, without even realizing that I was doing it. Compared to the pain Tsugumi gives me, this is nothing at all. It seemed that during the years I’d spent with Tsugumi, my body had come to understand in a hazy sort of way that, in the end, getting worked up really doesn’t take you anywhere. And there was something else that I understood as I stared into the orange light of the gradually darkening sky–something that made me feel sort of like I wanted to cry. For some reason it had occurred to me that love doesn’t ever have to stop. It’s like the national water system, I thought. No matter how long you leave the faucets running, you can be sure the supply won’t give out. This story you’re reading contains my memories of the final visit I made to the seaside town where I passed my childhood–of my last summer at home. The various people from the Yamamoto Inn who appear as characters have now moved away, and it’s unlikely that I’ll ever have another opportunity to live with them. And so the only place left in this world to which my heart can return is there in the days I spent with Tsugumi, only there. From the time she was born, Tsugumi was ridiculously frail, and she had a whole slew of physical ailments and defects. Her doctors announced that she would die young, and her family began preparing for the worst. Of course everyone around her spoiled her like you wouldn’t believe. Her mother carted her around to hospitals all across Japan, not sparing any effort, offering up every ounce of her strength to try to extend Tsugumi’s life even just a little. And so as Tsugumi toddled her unsteady way toward adulthood, she developed a personality that was just as pushy and insolent as it could be. 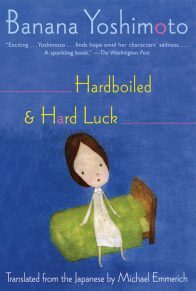 She was strong enough that she could manage to lead a more or less normal life, but that just made matters worse. She was malicious, she was rude, she had a foul mouth, she was selfish, she was horribly spoiled, and to top it all off she was brilliantly sneaky. The obnoxious smirk that always appeared on her face after she’d said the one thing that everyone present definitely didn’t want to hear–and said it at the most exquisitely wrong time, using the most unmistakably clear language and speaking in the ugliest, most disagreeable tone–made her seem exactly like the devil. My mother and I lived in the guest house of the Yamamoto Inn. The inn was Tsugumi’s house. My father was in Tokyo, having an awful time trying to work out a divorce with the woman he was married to then. The two of them had already been living apart for ages, and he and my mother wanted to be officially married. This meant a lot of coming and going for him, and you would have thought it would be kind of grueling, but he and my mother were always daydreaming about the day when all three of us would be able to live together in Tokyo as a real family, without needing to keep a low profile. Having that dream to hold on to seemed to make their lives fairly enjoyable. So in the end, although the situation may have looked somewhat complicated from the outside, I grew up as the untroubled only child of a man and woman very deeply in love. 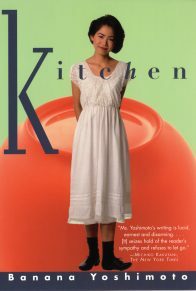 My mother’s younger sister, Aunt Masako, had married into the Yamamoto family, and now my mother spent her days helping out in the kitchen of the Yamamoto Inn. 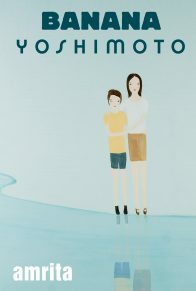 The Yamamoto family was composed of the following four members: Uncle Tadashi, who managed the inn; Aunt Masako; and their two daughters, Tsugumi and her older sister, Yoko. If I had to make a list of the Top Three Victims of Tsugumi’s Outrageously Nasty Disposition, the order would undoubtedly be: Aunt Masako, then Yoko, then me. Uncle Tadashi kept his distance. I have to confess, though, that just putting myself on this list seems like kind of a bad joke, it’s so presumptuous. In the process of raising Tsugumi, the top two contenders for the prize became so thoroughly gentle and good that they seemed almost to have entered the realm of angels. While I’m at it, I might as well clarify the age relationships. Yoko is one year older than me, and I’m one year older than Tsugumi. Not that I’ve ever, ever been aware that Tsugumi is younger than me. You get the feeling that she’s been the same ever since she was a little girl, that she’s just continued growing into her badness. Whenever her condition worsened and she was forced to take to her bed, Tsugumi’s ferocious temper would acquire an even sharper, more awesome edge. In order to facilitate her convalescence, she’d been given a beautiful room on the third floor of the inn, a room originally meant for two. She had the best view in the whole building, one looking out over the ocean. During the day, sunlight glinted on the water, and whenever it rained the waves would turn rough and misty, and at night the lights of several squid boats could always be seen shining through the dark. The ocean out there was beautiful. Being healthy, I can’t even begin to imagine how frustrating it must be to live through day after day of ambiguity, more or less sure that you’re going to die before long, but never entirely certain. There is one thing I can imagine, though, and that’s that if I were spending as much time lying in that room as she did, I would want to make that seascape and the scent of the tide something irreplaceable, something central to my life. But evidently that wasn’t how Tsugumi saw matters at all. She would do things like shred her curtains or keep the storm windows closed as tight as possible, and sometimes she’d turn over her dishes at meals, and then maybe throw all the books on her shelves across the tatami-matted floor, leaving her room in a state that reminded you of The Exorcist and making even her always-gentle family moan. At one point she got seriously into witchcraft, and started keeping dozens of “familiars’ in her room–slugs and frogs and crabs and so on. (There were always plenty of crabs around, so they were particularly convenient.) Tsugumi began sneaking these critters into guests’ bedrooms, and of course this led to complaints, so ultimately Aunt Masako and Yoko and even Uncle Tadashi were driven to tears, anguished at the way she was behaving. The smirk she wore looked oddly like the savior Maitreya’s smile. And it’s true, Tsugumi was beautiful. 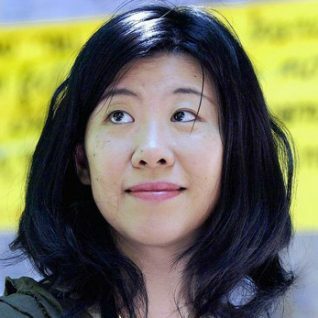 Long black hair, translucent white skin, and large, very large eyes. Eyelids with thick lines of long eyelashes that cast pale shadows whenever she let her gaze fall. Her arms and legs were long and slim, her veins seemed to lie just beneath the surface of her skin, and her body was small and tight–her physical appearance was so trim and gorgeous you could almost believe she was a doll fashioned that way by some god. Ever since junior high, Tsugumi had made a sport of flirting with the boys in her class, getting them to come out with her for walks on the beach. Her boyfriends changed so often it was a joke, and you always had the feeling that in a town as small as ours she was bound to end up becoming the subject of some rather nasty rumors. But instead people just came to believe that her kindness and beauty totally overwhelmed everyone she came in contact with, leaving them hopelessly entranced. That’s what the world saw of her–a fa”ade so charming the real Tsugumi would have seemed like someone else entirely. I suppose in the end we should just be glad that she didn’t make passes at the guests who came to stay at the inn. I bet she could have turned the place into a whorehouse if she’d wanted. In the evening, Tsugumi and whichever boy she was messing around with at the time would walk out along the tall concrete embankment that lined the beach, where they could look out over the gradually dimming bay. Birds would be swirling low under the tinted sky as the glittering sighs of the waves rushed quietly toward them. The beach, empty except for a single dog that was still out running around, seemed to stretch on like a desert, wide and white, and out in the water there were a few boats being tossed about by the wind. Off in the distance, silhouettes of islands began fading into mist, and a line of clouds faintly gleaming with red was slipping away beyond the sea. Tsugumi walks slowly, ever so slowly. Worried, the boy offers her his hand. She takes it in her own thin hand, keeping her head turned to the ground. Then she lifts her face and gives him a little smile. Her cheeks shine in the light of the sinking sun, and her face seems achingly fragile, like the overwhelming brilliance of the twilight sky, which keeps changing from instant to instant, never lingering for long. Her white teeth, her thin neck, her large eyes as they gaze into his–it all gets mixed up with the sand and the wind and the sound of the waves, and seems on the verge of dropping away into nothing. And of course it’s actually true: She could cease to exist at any moment and no one would be at all surprised. Tsugumi’s white skirt flaps back and forth in the wind. Every time I witnessed one of these scenes, I’d mutter to myself that it was certainly convenient the way she could go around transforming herself into completely different people like that–and yet even as I was cursing her I’d find myself on the edge of tears. Even for me, who ought to have known her true character well enough, those scenes on the beach had an aura of sadness about them that struck chords somewhere deep within me, filling my chest with pain. Tsugumi and I became very close friends as the result of a certain incident. Of course, we had known each other even as children. If you could manage to put up with her maliciousness and her vicious tongue, she was actually lots of fun to play with. As she imagined it, our little fishing town was a world without boundaries. Each grain of sand was a particle of mystery. She was smart and she liked to study, so her grades tended to be fairly high for someone who stayed home sick as often as she did, and then she was always reading books about all kinds of things, so she knew a lot. And of course one has to be fairly intelligent to start with, to think up so many different ways of being mean. During the early years of elementary school, Tsugumi and I played a game called “The Haunted Mailbox.” Our school was located at the base of a small mountain, and there was a garden out back. In the garden there was this old box that used to have a thermometer and a barometer and so on inside–classes had used it to study the weather–but now it was empty. The idea was that this box was connected to the spirit world and that letters from the other side would appear inside it. During the daytime we would go and put spooky stories or scary pictures that we had cut out of magazines inside, and then in the middle of the night we’d go back together and take them out. The garden where the box stood was an ordinary sort of place when the sun was up, but it certainly was frightening when you snuck out in the dark, and for a while we would both be totally absorbed in our game. But as time passed, “The Haunted Mailbox” got mixed up in all the other games we played back then, and eventually we forgot about it. In junior high I joined the basketball team, and practice was so demanding that I no longer had time to spend with Tsugumi. I’d fall asleep as soon as I got home, and there was always homework to do, and what with this and that she came to be nothing more than a cousin who lived next door. And then the incident occurred. As I recall, it was when I was in eighth grade, during spring vacation. A light rain was falling that night, and I had been cooped up in my room. In seaside towns like ours the rain carries the scent of the tide. All around me was the rushing of raindrops plunging through the dark. I felt depressed from the very bottom of my heart. My grandfather had just died. I had lived in my grandparents’ house until I was five, so I’d been really close to him. Even after my mother and I moved into the Yamamotos’ guest house, and even now that I had entered junior high school, I had kept going to visit him, and we frequently exchanged letters. I’d stayed home from basketball practice that day, but I couldn’t make myself do anything–I was just sitting there on the floor, slumped back against my bed, my eyes puffy from crying. At some point my mother came to the door of my room and called in to say that Tsugumi was on the phone, but I told her to say that I wasn’t home. I didn’t have the energy it took to be with Tsugumi. My mother knew as well as the rest of us how outrageous my cousin could be, so she just said that I was probably right, and walked off. I plopped back down on the floor and began flipping blankly through some magazine, and eventually began to nod off. And then I heard the sound of slippers padding toward my room from the opposite end of the hall. At the precise moment that I jerked up my head, the door slid smoothly open and I saw Tsugumi standing there, soaking wet. She was panting. Clear drops of water kept dripping down from the hood of her raincoat onto the tatami. Her eyes were wide open. “Maria,” she said, her voice feeble. “Huh?” Still halfway caught in my dreams, I turned to look up at Tsugumi. She had an expression on her face like she was feeling uneasy, as if something had frightened her. When she spoke, however, her voice was bossy and urgent. Handling it extremely gently, as if it were something precious, she slipped a single sheet of paper from the pocket of her raincoat and held it straight out. I reached out vaguely with one hand, wondering why on earth she was acting in such an exaggerated way, and took the paper from her. The moment I saw what it was, I felt as if I’d suddenly been shoved under a spotlight, right in the dead center of the beam. Take care of your grandmother, your father, and your mother. I hope you’ll grow up to be a fine woman, worthy of the Virgin’s name. I was shocked. For a moment an image of my grandfather floated through my mind–I saw his straight back as he sat facing his desk–and my chest felt as if it would burst. When I spoke, it was with incredible force. Tsugumi looked straight into my eyes, her brilliant red lips trembling, and answered me in a touchingly earnest tone, as if she were saying a prayer. I had completely forgotten that old weather box, but now in a flash all the vanished memories returned. Tsugumi lowered her voice to a whisper. Now, pressing the palms of her hands together tightly and holding them before her chest, she closed her eyes. She seemed to be remembering herself running through the rain to the mailbox, just a short while ago. Even now the quiet sigh of the rainfall was echoing through the dark. I sensed reality slipping away from me as I was sucked deep into Tsugumi’s night. Everything that had happened up to then, death and life, it all seemed to be sliding down into a whirlpool of mystery, a place where a different kind of truth held sway–that was the feeling, the softly uneasy stillness in the room. “Maria, what on earth should we do?” Tsugumi said, her voice very quiet, and it sounded as if it had been a struggle for her to say even this much. Her face was terribly pale. She looked at me imploringly. “Don’t mention it, kid,” Tsugumi replied. And without a glance back, leaving the door open, she was gone. For some time I sat there on the floor, rereading the letter again and again. Tears dripped down onto the carpet. A sweet, sacred warmth filled my chest. I felt the way I used to feel on Christmas morning when I woke to the sound of my grandfather’s voice–Well look here, there seems to be a present from Santa Claus!–and turned to see the wrapped gift lying by my pillow. The longer I kept reading, the less likely it seemed that my tears would ever stop. I slumped down over the letter and cried and cried and cried. Okay, so maybe I was a little gullible. I had my doubts, though! We’re talking about Tsugumi, after all. But those beautiful characters. The handwriting. The greeting that only my grandfather and I knew: ‘my treasure.” Tsugumi soaked by the rain, and the power in her gaze, the way it had spiraled into me, and her tone of voice. And what’s more, she had said with a totally serious face things she usually only said as a joke. Listen, kid, I’m a hell of a lot closer to death than the rest of you assholes . . . Oh yes, I had been magnificently deceived. The punch line came the next day. I went over to her house at noon, eager to have her tell me in more detail about the letter, but she wasn’t home. I’d gone up to her room and was there waiting when Tsugumi’s older sister, Yoko, came up to give me a cup of tea. “I’m afraid Tsugumi’s at the hospital,” she said, somewhat sadly. Yoko is short and round. She always speaks very mildly, almost as if she’s singing. No matter what Tsugumi does to her, she remains soft and calm–the only thing that changes is that she gets this sad look on her face. It takes something almost unheard of to get her angry. She’s the kind of person who really makes me feel small, you know, just being around her. Tsugumi went around jeering at Yoko, saying that she’d never met such a blockhead in her life and that the world would be a better place if she went and jumped in a lake, but I liked her a lot, and even looked up to her. There’s no way anyone could live with Tsugumi and not find her trying, and yet whenever you saw Yoko she was smiling brightly. To me she really seemed like an angel. “Is she feeling worse today?” I asked, worried. I figured that going out in the rain had made her sick after all. And then, as Yoko looked on in amazement, I turned around and ran my eyes over the shelves above her desk. Sure enough, there it was: A Semicursive Calligraphy Workbook. She also had plenty of paper and ink, an inkstone, a very fine brush, and to top the whole thing off, a letter of my grandfather’s that she had evidently stolen from my room. Angry as I was, I was even more astounded. What was it that made her carry these things so far? For someone like her who had never even held a brush properly, to produce calligraphy as skillfully executed as that in the letter would take an incredible amount of tenacity–I really couldn’t imagine where it came from, or what purpose it served. The room was awash in spring sunlight. Dazed, I turned toward the window and looked out over the faintly glimmering ocean, allowing my thoughts to drift. Yoko was just opening her mouth to ask what had happened when Tsugumi returned. Her face was flushed with fever, and she was leaning against Aunt Masako, taking small, listless steps, but the second she entered the room and saw my expression she gave a smug little grin. “Cat out of the bag?” she asked. I felt so outraged and humiliated that in a flash my face turned bright red. Springing to my feet, I shoved her with all the strength I had. Tsugumi crashed into the paper-paneled door, causing it to collapse, then flipped over and collided brutally with the wall. My aunt started to speak. I shook my head, tears streaming from my eyes. “Please, just don’t talk to me right now!” I cried, glaring ferociously at Tsugumi. I was so furious that even Tsugumi couldn’t find anything to say. No one had ever pushed her or been at all violent with her before. Perhaps at that moment, Tsugumi realized that unless she did something right away I would never have anything to do with her again for all of eternity–and that’s precisely what I was planning to do–because, as she lay there, still in the position she’d landed in, she looked straight into my eyes, her gaze very clear, and mumbled the words she had refused to say all her life, no matter what happened, however awful things got, even if you tortured her. Aunt Masako and Yoko were both stunned, and I was more shocked than either of them. All three of us held our breath, unable to speak. The idea that Tsugumi would actually apologize to someone . . . no, it was completely unthinkable! And so we simply froze there, bathed in a brilliant flood of sunlight. The only sound we could hear was the far-off noise of wind blowing through the town, which had by now firmly settled into afternoon. For some time, Tsugumi just kept rolling around the floor, whooping and holding her stomach as if she’d been suppressing the laughter the whole time and just couldn’t manage to keep it inside anymore. Seeing her like that, I burst out laughing myself. “Well, I guess there’s no point in being angry now,” I said, my face reddening, and then smiled again. The two of us reproduced the conversation we’d had during the rainfall the previous night for Yoko and my aunt, and the two of them stared in disbelief as we were swept up in round after round of riotous guffaws. For better or worse, that’s how Tsugumi and I ended up becoming such close friends. 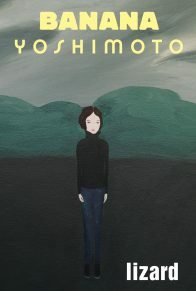 ©1989 by Banana Yoshimoto. Reprinted with permission from Grove Atlantic, Inc. All rights reserved.